THE LITTLE FIR TREE | Improve your spoken English. Learn English. Shetty the magician was returning home, when all of a sudden it began to rain. It rained heavily. Shetty looked around for shelter and saw a pretty little fir tree. He ran towards it as fast as he could. Soon the rain stopped. Shetty was happy that he did not get wet. “Thank you, you have been kind to me. I would like to reward you. Ask for four wishes and I will grant them." said the magician. 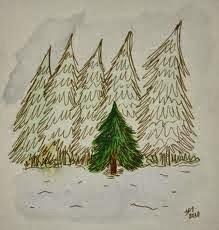 The sad fir tree had leaves like needles and no birds ever made their nests on it. So it said, "I wish I had green leaves like my other friends." Next morning, its wish was granted. Soon a goat came along and ate all the green leaves. "Oh! dear." said the fir tree. "I wish I had gold leaves as goats do not eat gold leaves." When the little fir tree woke up the next morning, it was surprised to see gold leaves. "How happy I am!" it said. A man came along and stole the gold leaves. "I wish I had glass leaves instead. Men do not steal glass leaves." The next day its glass leaves shone in the bright sun. "How happy I am!" it said. At night the wind blew whoo...oo...oo. All the glass leaves broke. "Oh dear!" said the fir tree. I like my old needle-like leaves best, for goats do not eat them. No man can steal them. The wind will do them no harm. The tree went to sleep. When it woke up the next morning, it had all its needles back again. "Oh! I never was so happy," said the little fir tree.